18 February, 2013. A persistent pesticide, Kepone (or chlordecone), is now suspected of causing chemical brain drain, many years after it was banned. A new study from the Guadeloupe, French West Indies reports deficient fine motor development at age 18 months in infants exposed to the pesticide. A total of 204 infants were examined, and exposures were assessed from analyses of cord blood and maternal milk. Boys appeared to be more sensitive to this effect than girls, and the effect on motor development replicates a previous finding by the same researchers from examinations of the children at age 7 months. Originally produced by Allied chemical company in Virginia, brain toxicity from Kepone exposure became evident when workers developed serious toxicity involving the nervous system. These workers showed blood concentrations that were 1000-fold higher than those reported from Guadeloupe. 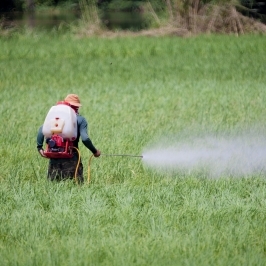 The pesticide was banned in the US in 1978. A ban in the French West Indies was deferred, but finally came into force in 1993. Its extensive use in banana plantations has resulted in serious soil contamination, and cultivation of the most contaminated areas has been restricted by local authorities. Kepone is listed by the Stockholm Convention and is now banned worldwide. The children included in the new study were born in 2005-2007, thus many years after the pesticide had been phased out. The mothers had absorbed the pesticide from their contaminated diet during many years and then passed on part of their burden to their children. The serum concentrations of the pesticide were of the same order of magnitude as PCB and DDE, two persistent contaminants that have been produced in much larger quantities. The effects attributed to Kepone in the new study were independent of exposures to these other brain drainers. Few recent data are available on serum-Kepone concentrations in the Americas, where the pesticide was most extensively used. The French West Indies thus represent a protracted case of Kepone brain drain due to the persistence of the chemical. While deficient development of fine motor function may sound innocent, other brain drainers have shown similar types of deficits in infants at the same age, and cognitive dysfunctions may well become apparent at later examinations. Most noteworthy is the finding of brain drain that was detectable at serum concentrations three orders of magnitude below those that caused toxicity in workers. I grew up in Hopewell VA during the time Kepone was manufactured & subsequently banned. My friends who lived in the Davisville community during this same time have disproportionate cases & deaths from various cancers. No one has examined the correlation of the residents in this community, only the workers in the plant. I smell a rat.